You’ve probably been told you need to eat more fiber but do you know the reasons why? Dietary fiber, mostly found in fruits, vegetables, whole grains, and legumes, is most well-known for being able to provide constipation relief. There are other health benefits to eating foods rich in fiber though. They can help people lose weight and reduce the risks of diabetes and heart disease. It’s not like it’s difficult to find great tasting foods filled with fiber either. It’s important that you find out how much dietary fiber you need and which foods have it. Of course you need to then eat enough of those foods. Find creative ways to make them a part of your meals and you won’t even notice them. Just adding salad to a sandwich made on whole grain bread is a small step that can go a long way. Dietary Fiber is also sometimes called bulk or roughage. It is the parts of plants that can’t be digested by the body. It’s different from other components of food like fats, proteins, and carbs. These are all processed and absorbed by the body whereas fiber isn’t. Fiber leaves your body in pretty much the same condition it entered it, unaffected by the digestive system. There are two main kinds of fiber; soluble and insoluble. Soluble fiber dissolves in water while insoluble fiber doesn’t. Soluble Fiber: soluble fiber forms a gel-like substance when it is dissolved in water. It reduces blood cholesterol and controls glucose levels. Soluble fiber can be found in oats, peas, beans, apples, citrus fruits, carrots, barley and psyillium. Insoluble fiber: Insoluble fiber helps move material through your digestive track and bulks up your stool. This makes it great for relieving constipation and correcting problems with irregular stool. If you want to get more insoluble fiber then increase your intake of whole-wheat flour, wheat bran, nuts, beans and vegetables like cauliflower, green beans and potatoes. Many plant-based foods are good sources of both soluble and insoluble fiber. How much of each kind of fiber is in a food depends on the food itself. So make sure you eat a wide variety of high fiber foods to get the most benefit. A high fiber diet normalises bowel movements: dietary fiber adds to both the weight and size of your stool while softening it. It’s easier to pass one of these bulkier stools so you’ve got less chance of being constipated. Fiber can also help to solidify loose and watery stools. This is because it absorbs water as well as adds bulk. It keeps your bowels healthy: Eating a high fiber diet can lower your chances of developing hemorrhoids and diverticulosis. Some of the fiber you eat is fermented in the colon and researchers are still looking at this effect and the role it could play in preventing colon diseases. Reduces cholesterol: The kind of soluble fiber you get in beans, oats and bran can reduce your blood cholesterol levels by bringing down your levels of low-density lipoprotein; the “bad” cholesterol. Studies have also shown that fiber can have other positive effects on the heart including reducing inflammation and blood pressure. Controls blood sugar levels: People who suffer from diabetes can really benefit from soluble fiber. This slows down the absorption of sugar to improve the overall levels of blood sugar in the body. Eating a healthy diet rich in insoluble fiber can help reduce the risks of developing type 2 Diabetes. Helps to lose weight: Eating high fiber foods tends to satisfy you more than eating a low fiber food. This means that you feel full faster and for longer. So you’re going to eat less food overall. If this wasn’t enough it also takes a little longer to eat these less “energy dense” foods. Being less energy dense simply means they have less calories. It takes a while to feel full in the first place so foods that are slow to eat and process like this are great. One more potential health benefit for eating dietary fiber is a reduced risk of developing colorectal cancer. Unfortunately the evidence isn’t conclusive so it’s impossible to say for sure if eating dietary fiber definitely reduces the risk of colorectal cancer or not. 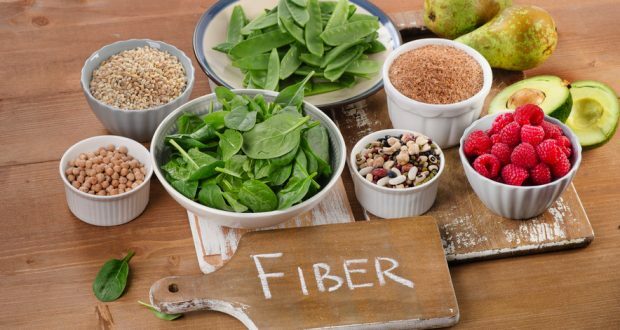 The Institute of Medicine, the body behind all things health and medicinal, provide the following guidelines on how much fiber adults need in their diet. It might sound like a lot of fiber but it is possible. Ensure that you always read the nutrition label on the food that you purchase and eat. If you have diabetes or are worried about developing it then chances are you already do this to count the number of carbs in food. Dietary fiber is in the carbs section of the nutrition label; listed under “total carbohydrates”. There’s no need to worry for you carb counters though. Remember that fiber isn’t directly absorbed by the body. This means that it doesn’t actually count towards your carbohydrate goals. A good source of fiber will have around 2 grams of fiber per serving but the very best sources of dietary fiber are going to have around 6 grams a serving. These delicious diabetic gourmet dark chocolate brownies provide a whopping 60% of daily RV for fiber. There are a number of ways you can increase your intake of dietary fiber even more. It’s important that you get enough soluble fiber as this is the kind that is best at regulating blood sugar levels. Foods rich in soluble fiber include fruits, vegetables and legumes. While you can find plenty of fiber in wholegrain foods these foods also tend to be rich in carbohydrates. As such they may not be the best choice for people dealing with diabetes. So the most obvious way to increase your fiber intake is to eat more whole fruits and vegetables. Don’t forget to eat the skins as that’s where most of the fiber is. Throw some lentils into your soup, salads, or even main dishes to eat more protein and fiber without having to eat more unhealthy meat. Another great way to eat more fiber is to add some flaxseeds to your yogurts and smoothies. The best way to get fiber is through whole foods like fruits and vegetables, but there are also other healthy choices. 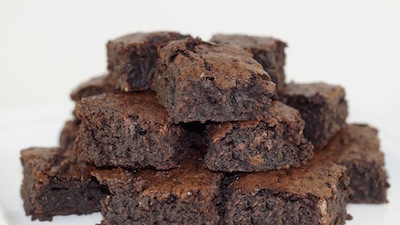 These delicious diabetic gourmet chocolate brownies provide a whopping 60% of daily RV for fiber and they contain no artificial sweeteners or sugar alcohols. While it is true that these high-fiber foods are good for you they can also give you intestinal gas, bloating, and cause cramps. Don’t take on too much at once and gradually introduce more fiber to your diet over time. That way you are giving time for your digestive system to adapt to the change and deal with it better. Be nice to your body so that it can be nice to you. Finally make sure that you are drinking enough water. Fiber is at its best when it absorbs water. Fiber filled with water is better able to give you a soft and bulky stool. I love the information and really love reading ur ads -it really helped me about diabetes,thanks so much. Pingback: Shocking Report - 40% Increase In Diabetes Diagnoses Worldwide! Pingback: Is Your Diet Missing These 7 Important Nutrients? Pingback: Fiber Lowers Blood Sugar - But Are You Eating Enough? Pingback: Enjoy Pasta Dishes Without The Blood Sugar Spike - Try Zoodles!